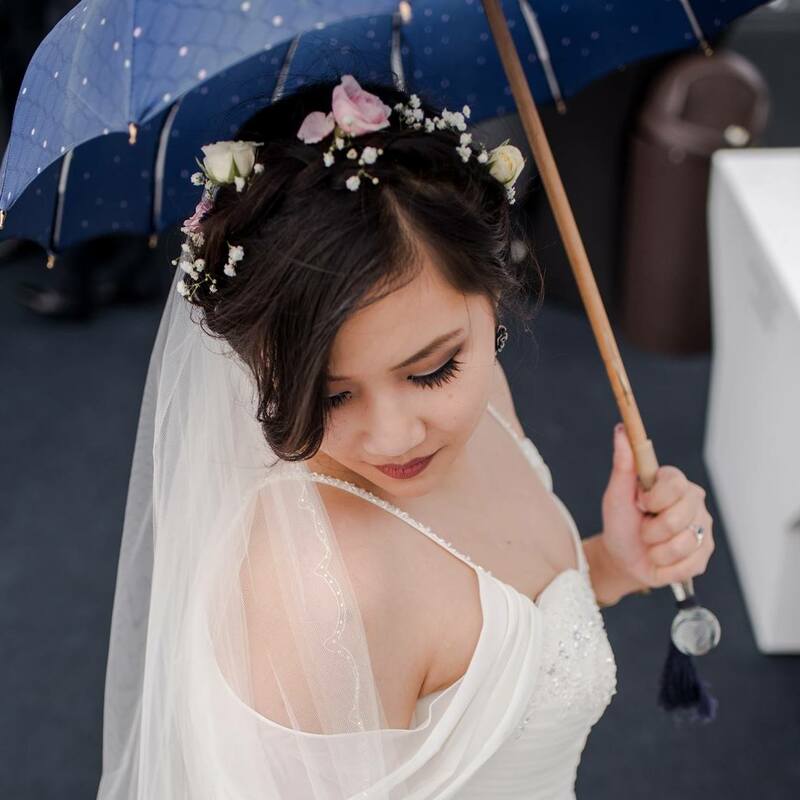 Well, I've decided to bring the ol' blog back around, after a nice long 2 year stint of only posting pictures on Instagram. In the time since my last post, I've largely stopped buying makeup (okay, so it's more of a very low buy than an actual no-buy) and gotten very into indie nail polish. Like, I had 20 nail polishes, mostly drugstore, and now I have at least 500, mostly indie. So, accordingly, my plan is to start posting my polish reviews and swatches here, along with the makeup looks that I still love doing. 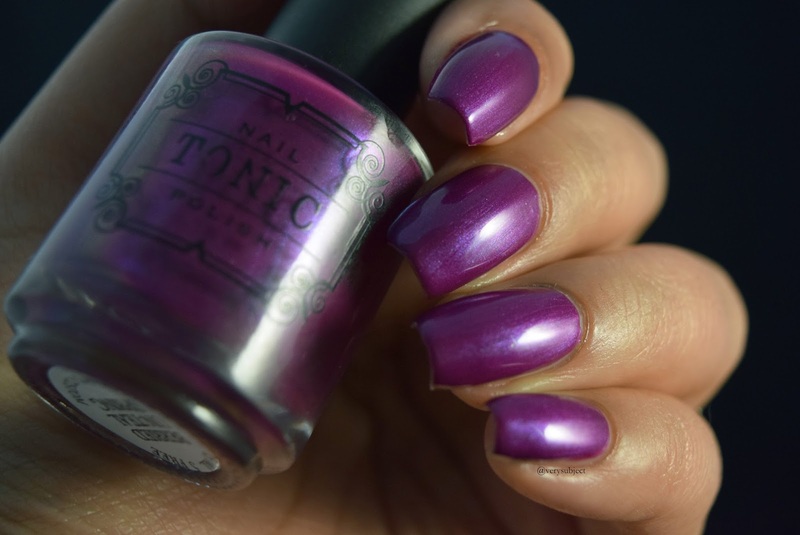 I thought I might kick this off with some swatch pictures of the current belle of the nail polish world colloquial ball, Tonic Nail Polish! My most recent order contained a few group customs that are still available, a charity polish that is also still available, and a gorgeous one-time release that is sadly no longer available. All polishes were purchased on my own, and any links provided are for convenience. First up is Tracks in the Snow, one of two SHIMMAHS Facebook group customs. You do need to be a member of the group in order to purchase them, and they'll be available until Tuesday, Oct. 10 2017. Tracks in the Snow is a blue-green with golden, almost greenish shimmer. It goes on very smoothly, and as you can see, the shimmer is NOT shy. The base color is in this special place on the color spectrum, where if you put it next to a teal like Tonic's Deep Sea-crets, it'll look straight blue, but next to a blue and there's never been a teal-er polish. This is 3 coats with top coat, but it is pretty opaque in 2. Most of these pictures are taken in artificial light. The second SHIMMAHS group custom is Berried Un-Teal Spring. This is a fuchsia pink with a lovely, bright, teal flash of shimmer which also shifts to blue and pink. Disclaimer, I did color-correct this photo because my camera was very confused and pulled the polish very blue while leaving my skin perfectly normal. Thanks for the extra work, camera-buddy. With the correction, it looks on my monitors to be accurate to life. The second photo shows off the shift in the shimmer. This is 3 coats and top coat. This is Furple, a custom for Crystal's Charity Lacquers. 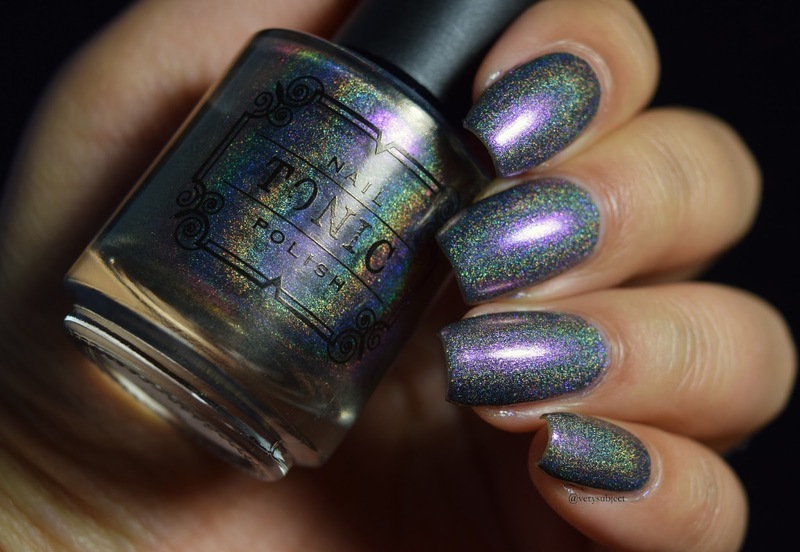 $5 from every bottle sold of this polish (as well as Project Aloha, which is being rereleased for this charity sale!) will go to the Houston SPCA. Sale ends this Saturday, Oct. 7th. I also color-corrected this one, as my camera pulled it suuuuuper blue, but it's more of a strong linear holo with a purple to pink shifting shimmer. Second photo is more shift, less holo... but the holo is pretty strong anyway. 2 coats and top coat. Finally, I have Peacock Parade. This was originally a private custom, but the person who originally had the custom made allowed Tonic to sell it to the public in a one-time sale. It's breathtaking. 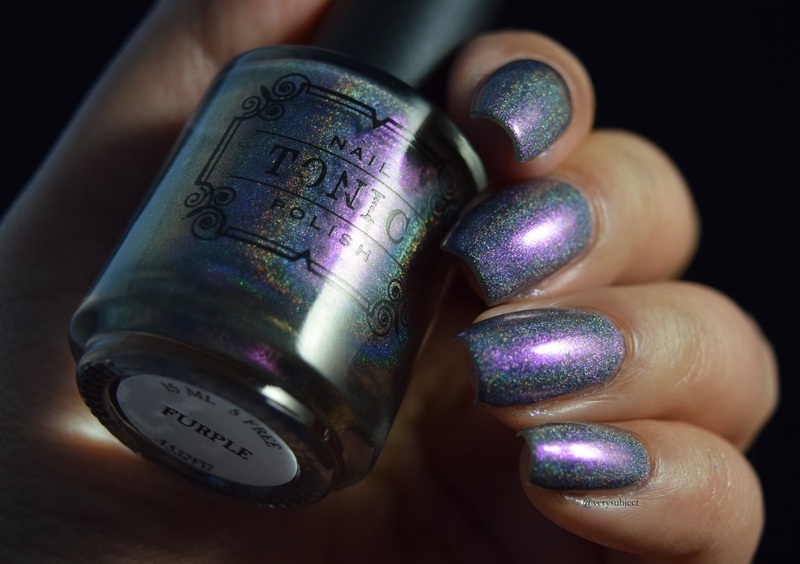 This is a pure multichrome polish with the same shift as another Tonic polish, Dragon Tears—which I often like to say blows my mind. The main shift is an aqua-teal/green, and it cycles to blue, purple, pink, orange, and yellow. This is 3 coats and top coat. I'm just gonna dump a bunch of pictures here because whoa. Some were taken outside and some inside; I also have a cute little video on my IG showing the shift. Honestly, these could probably have used a little bit of the same color-correcting treatment I did on the other polishes, since my camera appears to believe that real life is lying about the color green, but honestly I'm running out of steam and I just want to publish this post now. Oh, and I know you might not believe me, but these are all the same polish. All of them. I promise. Beautiful swatches Celia, I love the one of Berried Unteal Spring that shows the shimmer so well. Is it obvious in person in natural light? Yes, it is! I think cameras hate to pick it up, and it's also hard to see sometimes because it shifts to a color that's more similar to the base. The shimmer in Berried is definitely not as strong as the shimmer in Tracks, though. Thanks, I'll pass on your compliment! I'm pretty sure he thinks he's a model lol. I definitely don't wear makeup as much as I used to, just because I usually have time to either do my nails or my face, and it's usually easier to pick my nails.